Review by Andreas Nachtsheim, "WDR1"
If you understand German, you might want to click this link to hear West-Deutsche Rundfunks very positive review of Altera Luce, with several sound examples. We were happy to hear phrases like "...mit viel Geschmack und auf hohem künstlerischen Niveau...", or "Der Klang des Ensembles ist makellos", or also "Dabei gelingt der dramaturgische Spannungsbogen aus Alt und Neu so exzellent, dass das Ganze auch wunderbar als Live-Konzert funktionieren würde." Review by C. Moore, "American Record Guide"
"Currentes excels in the artful blending of voices and instruments", according to C. Moore at the American Record Guide. Somewhat disconcerted by the contrasting timbres and textures of Buene´s pieces for the ensemble, the reviewer nevertheless would like to hear more of Buenes music. You can read the review here (in English). 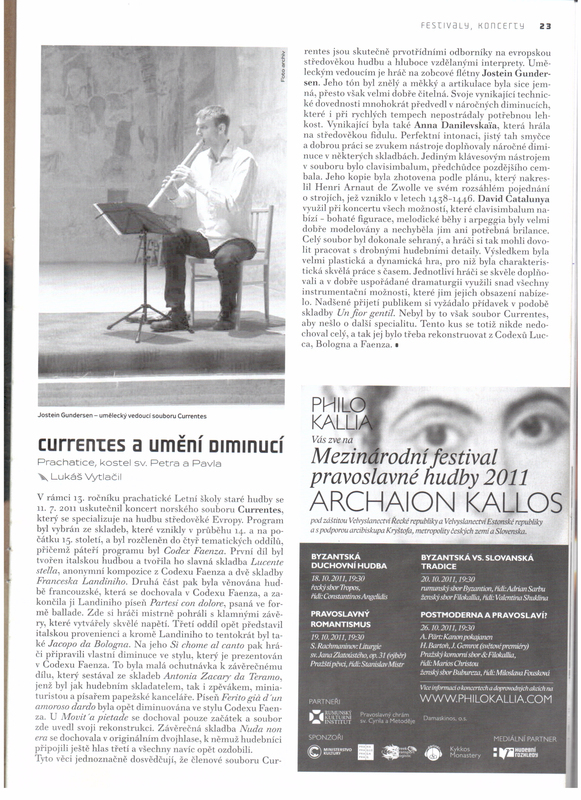 Review by Nuria Serra, "Sonograma Magazine"
"Altera luce examplifies the high level of these professionals", states Núrie Serra for the Catalan magazine Sonograma, adding that "Jostein Gundersen is not only an excellent flutist but also directs very interesting projects." You can read the review here (in Catalan). 6-star review by Guy Richards, "Klassiskmusikk.com"
"A fantastic collection", says Guy Richards for Klassiskmusikk.com, giving the record 6 out of 6 stars and adding that this record proves that Currentes is a very competent vocal and instrumental ensemble. "A true joy." You can read his review of our CD "Altera Luce" here (in Norwegian). Review by Trond Erikson, "Den klassiske CD-bloggen"
"A very good record", states Trond Erikson in the Norwegian classic CD-blog. You can read his review of our CD "Altera Luce" here (in Norwegian). "Currentes is on a par with more famous ensembles", says Stavanger Aftenblad´s Bø-Rygg, in a very positive review of our second CD, "Altera Luce". Read the review here (in Norwegian). "Von zauberhafter Klarheit" writes Viktoria Silbert in Wormser Zeitung, in her review of our concert in Worms Cathedral October 8th. The programme was "Eine Messe für Zacara". It marked the ending of our project "Zacara Triduum" with the ensembles Leones and Micrologus, and the musicologist Francesco Zimei. Read the review here (in German). A very sympathetic review of our concert in Oslo Ladegård 22.10.16., by Dagbladet´s Ståle Wikshåland in Dagladet. Read the review here (in Norwegian). Finally an Italian review, and not a bad one! 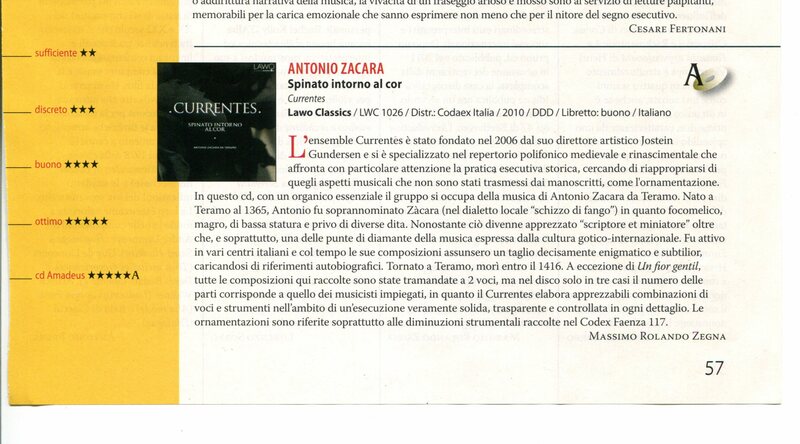 The leading Italian magazine for classical music, Amadeus, chose "Spinato intorno al cor" as one of the three best CDs of the month in their May issue 2013. Read the review here (in Italian). The amongs early music performers much read webpage www.medieval.org has "Spinato intorno al cor" as runner up for Medieval CD of the year 2012. We are very proud! Read the review here (in English). 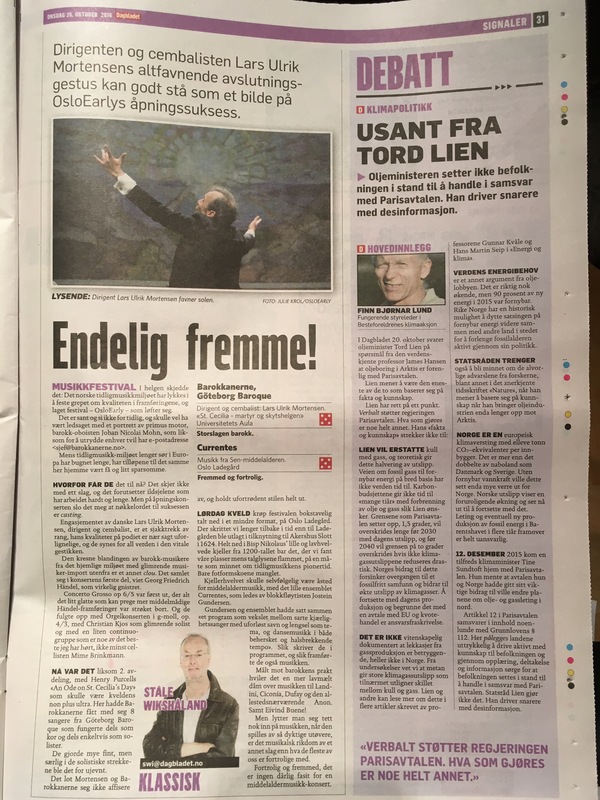 In a short review of Currentes´ debut-CD "Spinato intorno al cor", Geir Hovensjø of the Norwegian Newspaper "Østlendingen" describes the ensemble´s performance as "bright, airy, elegant and absolutely delicious". Read the review here (in Norwegian). Linn Carin Dirdal has interviewed Currentes for Ballade". There was alos a very good interview with us by Ida Habbestad for the same web-magazine in February, to which we would like to link here again: "Det nye i det gamle". Both interviews are in Norwegian. Swedish review of "Spinato intorno al cor"
Mikael Bengtsson of the Swedish newspaper Norran has reviewed our CD. He finds it a "fascinating musical experience" and is particularly impressed by the expressive voice of our tenor Kjetil Almenning. Read it here. "…[the] members of the ensemble Currentes are truly first-rate specialists in European medieval music, and deeply educated interpreters." "The whole ensemble was perfectly integrated, so that the players could afford to work with tiny musical details. The result was very shaped and dynamic playing, characterised by their great work with time. The single players supplemented each other very well, and with well-organised dramaturgy they used maybe all the instrumentation possibilities which their set offered." Currentes performed "Spinato intorno" in Burgheßler, Germany, on the 18th of July. "Das alles zu hören war musikalischer Hochgenuss", wrote Hans-Dieter Speck of the Naumburger Tageblatt. "For Jostein Gundersen har kjærligheten til instrumentet ført ham til slutten av et treårig forskningsprosjekt som stopper både i middelalderen, renessansen og barokken." skriver Walter N. Wehus i nettavisen for Universitetet i Bergen, "På Høyden" den 25.3.09. Intervjuet med Walter N. Wehus (se oppslag ovenfor) er idag publisert på webstedet forskning.no, en nettavis med norske og internasjonale forskningsnyheter.